Lavaridge Town is a small, but cool place. You can go into the Pokemon Center and go through the back door to enjoy a dip in the hot spring. Outside, people are buried in hot sand. 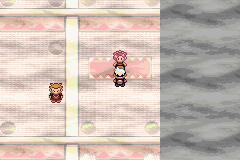 The old lady above the old man will give you an egg that contains a Wynaut. Next to the gym is a store. Go inside and talk to the old man wearing purple. He'll give you a Charcoal. Afterwards, head for the gym. The Lavaridge Gym is full of little hot spring holes. What you need to do is go through all the holes and try to end up with the gym leader, which could be frustrating to do. This is something like Sabrina's gym in previous games, except this time if you go up to a wrong hole, you'll need to face a trainer. Follow the steps below only if you don't want to battle any trainers. In the first room, the pool on the left goes to the next area. In the next area go into the only other pool. After that, enter the pool at the upper-left hand corner. Go to the only other pool. Then go to the pool to your left, then to the upper-right. After, that, take the only other pool, and then the lower-right. Go down to the single pool, and finally you'll meet the gym leader. Note that in Emerald, the layout is a bit different from the one described here. 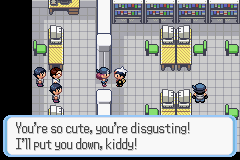 The gym leader is Flannery. She, like everyone else in the gym, uses Fire Pokemon. She has two Slugma, and one hot Torkoal! In Emerald, she has one Numel, one Slugma, one Camerupt, and a Torkoal. After you defeat her, she'll give you TM50 - Overheat and the Heat Badge. Now all Pokemon up to level 50 will obey you, and Strength is allowed outside of battle. When you get out of the gym, your rival will talk to you and give you the Go-Goggles. With these goggles, you'll be able to get through the deserts without any problems. Before you do anything else, go deep into the desert, and I mean all the way north. There, you'll find two fossils. One is the Root Fossil, and the other is the Claw Fossil. You may only pick one, as the other one will sink back into the sand. At the very south of this sandstorm section, you'll find TM37 - Sandstorm. 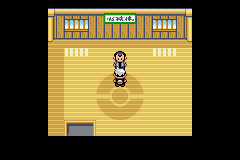 Now it's time to go all the way back to Petalburg City to challenge your father to a gym battle. During your journey, you're probably going to go through Rusturf Tunnel again. Go west and south, and you'll come to to a place where a Nerd says that he lost his glasses. Look around, and you'll find a pair of Blackglasses. You'll have to look hard, because it's hidden. Finally, you've reached the gym leader, better known to yourself as "Dad." To other people, he's Norman. Like the rest of the gym, he uses Normal Pokemon. He has a lv. 28 Slaking, a lv. 30 Vigoroth, and another Slaking. This one, however, is lv. 31, and quite hard to knock out. In Emerald, Norman has a lv. 27 Spinda, a lv. 27 Vigoroth, a lv. 29 Linoone, and a lv. 31 Slaking. After you defeat him, he'll award you with TM42 - Facade and the Balance Badge. With this badge, all of your Pokemon's Defense will rise, and you'll be able to use Surf outside of battle. He also tells you that Wally's parents want to see you. So now it's time to go to Wally's house, which is right next door to the gym. Talk to his father, and he'll give you HM03 - Surf. 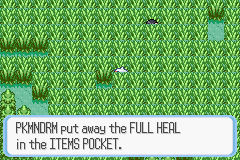 In Emerald, you'll be taken to Wally's house automatically. Now you can cross the oceans without a boat! Now you must go east and travel all the way to Mauville City! Talk to the gym leader, and he'll give you a Basement Key. He needs you to go to New Mauville to switch off a Generator. New Mauville is basically the Power Plant of Hoenn. This place is "a short Surf away from Route 110." So now get into the water, and head east. Soon, you'll reach an island with a cave. Go in there, and you'll be at New Mauville. Use the Basement Key to open the door. When you get inside, step on the blue switch so the other door can open. Afterwards, you'll need to step on many switches to get through. When you finally get to the Generator, simply step on the red switch, and it'll turn off. 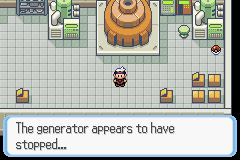 Close by the Generator is the Thunderstone! Now go back to talk to the gym leader. He'll give you TM24 - Thunderbolt for your trouble. When you get to Route 118, surf east to get to the next city. You'll reach the beach, and you'll meet those two interviewers again. You can battle them if you want to. Keep on walking, and Steven will pop out to talk to you. His short talk with you won't affect you in any way, though. Now you must go north to Route 119. Here, you'll find a lot of tall grasses, which you cannot get through on Bike. You'll find a lot of trainers hidden here searching for Bug Pokemon. The screenshot to your left shows you a hidden item that can be found. Right when you get out of the tall grasses, surf to the piece of land to your left to find a Zinc. Continue north, and soon you'll reach a weather institute, closely guarded by Team M/A. Go inside the building, and go upstairs. As you do so, you'll be battling many Team M/A members. The final battle is with the Admin of the team. After you beat her, the scientist will come out to talk to you, and give you a Pokemon called Castform. This Pokemon is special, because if it rains in battle, it changes its physical appearance. It's holding a Mystic Water, too. Now you can leave and go on. Walk a little, and your rival will come out to battle you. Her Pokemon isn't totally tough to beat at all. For beating her, she'll give you one of the best HMs in the world of Pokemon: HM02 - Fly. Teach this to one of your Pokemon, and they can fly to any city that you've been to before. It definitely saves a lot of walking or bicycling. But before you can use this, you must get the badge from Fortree City, and that's where we're about to arrive at!